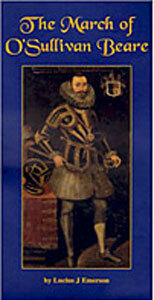 O'Sullivan the Chieftain of Dunboy castle began his forced march from the woodland of Glengarriff. After his defeat and retreat from his fortress he sheltered for a time in the area known as Doire Na Fulla (The Oak Tree of the Blood). Legends will say that many of the primitive stone shelters encountered in the mountains, date from this settlement. There is no doubt however that the oak woodland, more extensive at that time, would have been an ideal base from which to regroup his forces. He left on December 31st to begin his retreat to Leitrim and it is said that his wife and young child stayed behind and sought shelter in a place known as Eagle's Nest. O'Sullivan past Carriganass Castle, the last of the O'Sullivan castles. He travelled over the hills onto Gougane Barra. 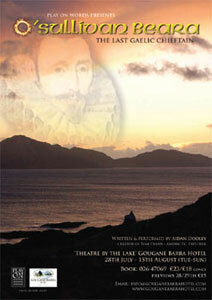 From here he had the last view of the Beara Peninsula and Bantry Bay, which is family ruled for over 400 years. When O'Sullivan Bere made his epic retreat in 1602, his first camp was An Teampaillin, Augheris, 5km north toward St. Gobnait's shrine in Ballyvourney, O'Sullivan had his misfortune to lose his horse, known as An Cearc, drowned in a place known to this day as Poll an Circe (The Hole of the Hen). Only one of the great many losses that winter. 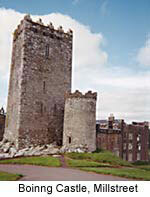 near Millstreet and was afforded food and hospitality by O'Keefe at Boinng Castle. Some O'Keefes attacked them nearby at Flintfield and the McCarthys of Drishane and Kilmeedy tried but failed too ambush them. They travelled north to Clonfert (Newmarket) via Maher and Derrinaturbid and were welcomed by Mc Auliffe. On hearing of a threatened attack by Barrys of Buttevant they swung east to Freemount and to Ardfinnan and the Glen of Aherlow rather than a direct approach to the River Shannon. 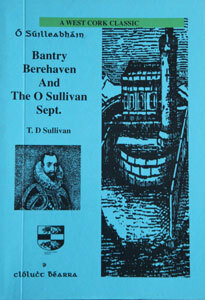 O'Sullivan Bere made his crossing through Ballyhoura country leading west past Kanturk and Newmarket. Here they fought their first major engagement by an English garrison assisted by the Barrys when crossing a ford near Liscarroll. The Queen's army was forced to retire through hunger and fatigue. The column had now to cross the Golden Vale to get to the safety of the Slieve Felims. At Kilmallock, the White Knight and his mercenaries attacked. They were then attacked at the rear by the previous day's assailants but succeeded in avoiding a clash. Chief town of the Golden Vale is Kilmallock, capital of the Earls of Desmond. 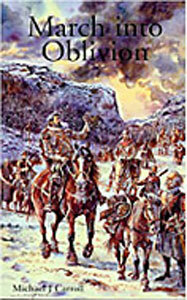 Mercenaries of the White Knight, the Gibbons, men from Limerick City and some Crown forces, in all making up more a mob than an army, came upon O' Sullivan's host, making for the mountains. This battle may have been in the region of Knockany, Hospital or Emly. It was by far the fiercest battle that the refugees had suffered thus far. After their heavy losses O'Sullivan and his men reached Slieve Felim, where the Twelve Peaks are seen. 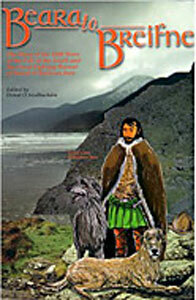 They camped at Solohead (sulchoik, the Sallow Wood) - a famous place, made famous by Brian Boru, Dan Breen and Sean Treacy. Here they recovered themselves and set off for Donohill (Dun Eochaille, fort of the Yew Wood) there was a considerable store of food. Their hunger gave them the courage to storm the place and gain access to the food-supplies. Onwards towards Cappawhite. So numerous were their attackers that the fugitives feared complete destruction. Ormond left them no choice but to defend themselves by attacking. This they did with some success, but also with some losses. Out of O'Sullivans one thousand followers only two thirds now lived. On the way they marched the road which climbs the side of Knockafine, and on to the peak of Slieve Kimalta (Sliabh Coimealta, Keeper Hill) which is nearly the highest summit seen in all the march. That night they camped at Latteragh. Then onto Knockshegowna, Lackeen and towards the river Shannon where it enters Lough Derg. When O'Sullivan reached the Shannon Crossing, there was no boat to be found. O'Sullivan decided to kill his horses, which he ate and used the skins of the horses to make currachs. 2 currachs were made. One by the Beara men, which was long and thin. The second by the Connaght men which was a little tubby craft. The Connaght boat sank on its first crossing. O'Sullivan got most of his followers across but was attached by MacEgan (Redwood Castle) on the Tipperary side and lost some of his followers who were drowned in the river. O'Sullivan fought his way up to Aughrim, raiding villages along the way for food. O'Sullivan was attached north of Aughrim and was outnumbered three to one but his soldiers were well trained and fought a daring battle and won the day. At nightfall on January 11th 1603 O'Sullivan and his followers arrived on the Southern slopes of Sliabh Mhuire (Mt. Mary) between Ballygar and Creggs, tired and battle weary after their encounters at Aughrim they decided to set up camp for the night. When they awoke the following morning the whole area was covered in a thick blanket of snow. Many of his followers were to stay behind on the mountain while others died of exposure and exhaustion. The following day as O'Sullivan Bere and his followers moved Northwest to Glens castle they had hoped to get help from the locals but found that the landlord McDavid Burke had organised his people against him. They approached Glinsk Castle only to be turned away but later returned with flags and drums captured at Aughrim, but the Burkes were not to be fooled and O'Sullivan and his men were chased to Sliabh O'Flynn near Ballinlough. O'Sullivan passed Lough Gara, travelled over the Curlew mountains and the Bricklieve mountains and on around Lough Arrow down to Knockvicar. 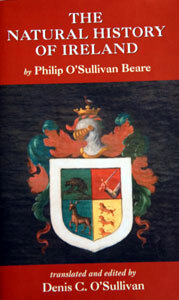 It is claimed that O'Sullivan Bere found the people of the Northwest friendly and more neutral than the people from other regions through which he had already passed. O'Sullivan passed through the village of Knockvicar, passing by Lough Key - an area which Arthur Young referred to as the Killarney of the West -"It is one of the most delightful scenes ever beheld - a lake of circular form, bordered very boldly by mountains...." At Knockvicar O'Sullivan's people rested for the last time and from here the warriors made their way through forested areas en-route to their final destination. The last part of O'Sullivan's long voyage took him from Knockvicar to Leitrim where he hoped to meet with O'Rourke in O'Rourke's Castle. However by this time only thirty-five of the original one thousand men had survived the journey. A stone has been erected on the ruined wall of the Castle with the O'Sullivan and O'Rourke coat of arms the inscription reads - "Here on January 4th 1603, arrived Donal O' Sullivan Bere and his followers after the epic march from Beara Peninsula in fourteen days....".